The United States Navy is the most preeminent naval force in the world. Following Alfred Mahan dictum that “a truly powerful nation must have thriving international trade, a merchant fleet to carry these goods and a strong navy to protect its sea lanes,” the U.S. Navy has provided stability, tranquility and maintained the global order since the end of World War II. However, in this age of austerity, the ability of our aging fleet to secure our interests, protect our allies and confront our adversaries is being sorely tested. As we paused in remembrance of the 73rd anniversary of the surprise attack on Pearl Harbor, Hawaii, by the Imperial forces of Japan, we again see a rising power in Asia bent on changing the status quo, increasing pressure on our allies and challenging America’s preeminence in the Pacific. It is clear our Navy is facing ever-increasing operational challenges, including not only air and sub-surface threats but also supersonic cruise missiles and ballistic missiles (both anti-ship and surface to surface). Individually, these threats are difficult enough to combat, however, when encountered simultaneously; these threats severely challenge the current capabilities of our Navy. With a rapidly expanding Chinese Navy, coupled with the increased pace of Russia’s ship building efforts, the pressure to do more with less compels us to develop new technologies to maintain the advantage if or when confrontations occur. For the last 70 years, radar has played a key role in maintaining technological superiority over our adversaries. Over the last decade, however, our radar capabilities have proved to be increasingly incapable of addressing existing and emerging threats. This, in turn, directly impacts the Navy’s ability to assure maritime security and freedom of the seas. Fortunately, the Pentagon has taken positive steps to rectify the situation by making investments in the next generation of radars. The Air and Missile Defense S-Band Radar (AMDR) is an excellent example of advanced radar technology that will fill critical capability gaps and ensure our sailors can meet the ever changing demands of today’s global threat environment. Designed to replace the ageing Aegis combat system currently employed in the fleet the AMDR is constructed as a self-contained radar that is scalable for any platform for any mission, with the ability to exponentially increase radar sensitivity. Not only will the AMDR more accurately detect missile threats, but it will also help ships run more efficiently. This new system reduces space, weight, power, and cooling demands of naval vessels, thereby maximizing the service life of the ships that incorporate this new technology. These long-term cost savings make AMDR a wise use of limited taxpayer dollars in today’s austere budget environment. With the ability to confront multiple threats simultaneously — even in the presence of heavy land, sea, and rain clutter — the technological advancement of the AMDR is truly remarkable. 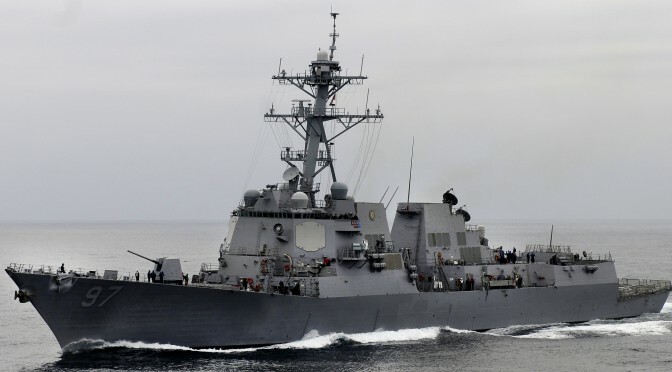 Scheduled to begin installation on the Arleigh Burke class destroyers’ starting in 2016 the AMDR is the technologically advanced, low-risk, cost-effective radar solution to combat today and tomorrow’s threats. Commander Feldkamp is a retired Naval Electronic Counter-Measure Officer (ECMO). He flew combat missions in Desert Storm off the U.S.S. Midway and served as the international outreach officer for the National Maritime Intelligence-Integration Office and the Office of Global Maritime Situational Awareness in Washington, D.C. He currently is an adjunct professor teaching the theories and politics of terrorism at George Mason University.